Shoe protest at Press Club against sending Bangladesh team to Pakistan. Update 3: We have decided to remove a potentially offensive image posted from facebook. That criticism of all things Pakistani inevitably takes on racist undertones is something that might be the subject of a future post. Update 2: [Purboposhchim again] Gilti Mia points out in the comments that Stuart Law is not renewing his contract in July. This means he would have gone with the tour had it gone through. I see a lot of merit in this argument and should emphasise that my comments regarding Stuart Law was simply my own speculation. I have no inside information about his motives. Update: [Purboposhchim here] Adblogger5 makes some good points regarding Kamal’s personal interest in placing our players at physical risk by touring Pakistan. But no one seems to be asking if it has already cost us something. Does no one else see the connection between a life-threatening tour and the resignation of one of the better coaches we have had in recent times? Stuart Law is a gentleman to suggest that it is merely “family issues” and nothing more that made him resign. My feeling is, his family would probably have not said anything if he were to remain in Dhaka. Of course, eita jodi BNP’s sports minister hoito, eto khoney Sachalayataner blogger ra 500 bar “Rajakar” shobdo ta bebohar kore felto. In Bangladesh, putting personal gain above national interest is the norm, especially for individuals in position of authority. However, the actions of AHM Mustafa (Lotus) Kamal seem to have crossed a line and ignited a backlash that has the potential to be both broad and furious. Will Kamal get his way and get Bangladesh to tour Pakistan, as a way to repay the huge favor that PCB did to him a few months back? Or will the backlash force Sheikh Hasina (yes, it will have to come from Hasina- that’s how things work in today’s Bangladesh) to once again step in? The force of the public opinion against touring Pakistan is intense. Daily Star has already fired the opening salvo, and its coverage is bound to get more shrill as we get closer to the tour, scheduled for the end of April. Amader Shomoy has this poem by Lutfor Rahman Riton. 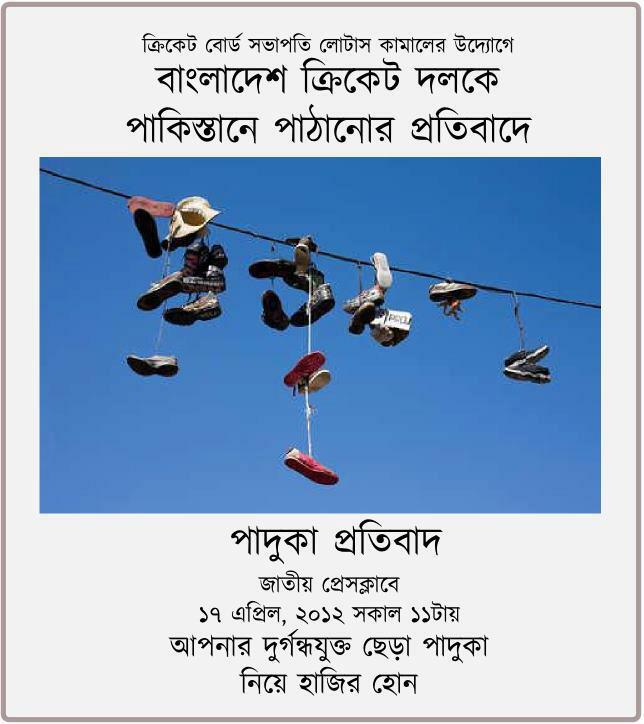 And Sachalayatan, arguably the most influential Bangladeshi blogsite, has taken up the mission of opposing this tour. While a small portion of the rhetoric against touring Pakistan is couched in unfortunately xenophobic terms, there is no denying the fact that there is no sense in going forward with this trip. The security of our players has to be of paramount consideration, and the sad fact is that Pakistan is unable, at this moment, to guarantee the safety of our players with any degree of confidence. And to be fair to them, as the war in Afghanistan enters its endgame, Pakistan’s policymakers probably have more pressing issues on their mind. Even assuming, hypothetically, that the chances of an attack on Bangladesh’s cricket team are small (an assumption undercut by the events in Pakistan over the last four years), why should we take such a risk? Even before sending soldiers into combat, policymakers examine and re-examine the costs and benefits. Mushfiq, Sakib, and the rest of their teammates are young men with families and loved ones. How can we, in good conscience, ask them to take such a risk? If anyone in BNP was actually interested in political triangulation, this would be the perfect issue for the party to bash the government. The public opinion, especially that of thought-leaders, is solidly anti-trip. Lotus Kamal is quite thoroughly reviled because of his involvement in the share market scandal and the photo of Sakib genuflecting at his feet. It would let BNP take a ride on the let’s-bash-Pakistan bandwagon. And it could then be segued into discussion of the fake ISI news item. The chances of such coordinated intelligent behavior on BNP’s part is slim. However, much more importantly, the chances of stopping this ill-conceived tour, especially with a coordinated media campaign, is much higher. And that seems to be the best remaining course of action. How reliable is the info that Stuart Law is resigning because of the pakistan trip? What I read is that he will not renew his contract after July. That means he is touring Pakistan with the team if team goes there. Also anyone in the board could have told him that the trip may as well be cancelled anytime. BCB staged the ploy and government is encouraging the protests so that the trip can be cancelled in the last moment citing massive protests. Then BCB can tell PCB that we tried. Also Stuart Law in a professional coach. They usually don’t get involved in cricket geopolitics. One of his compatriot just started coaching Pakistan. Law may as well vie for that job someday. Why he will anger a cricket power country in such a silly manner? Law spent a good part of last few years in the heaven of suicide bombers, Srilanka. Pure speculation Gilti Mia. I will update the blog to reflect that. Stuart Law was part of the same professional team that refused to tour Sri Lanka in the 90s, but as you point out, has been there since. Also now that the tour is off, it is moot whether he will go to Pakistan or not. Again, this was just my gut feeling. Personally I would take a pay cut and live in Brisbane than be in good books of cricketing powers and tour Pakistan. Once you are dead, you are dead – risk allowance not withstanding! a very very stiupd stiupd analysis full of hatredouldbanglash is a bery very dear brotherly country with pakistan.we pakistani love bangladeshi nation,will love them for ever.but this indian propaganda machine would be unsuccessful INSHALLAH.they should understand this was a cricket match.long live pakistan and long live bangladesh.